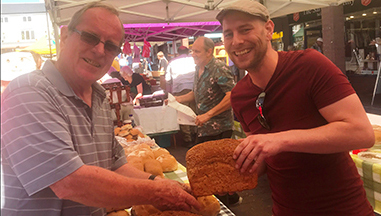 “While the monthly Farmers’ Market in Stone is managed by the Borough Council its origins lie with the first ever Stone Food and Drink Festival. We retained an involvement in logistical and promotional support of the market and, as a CIC, we are keen to reinvest funds from the annual food & drink festival into foodie-related events for the good of the town. With the Farmers’ Market being such a big draw for visitors, when we reviewed the website and realised it was in need of updating, financing the new website seemed like the perfect way to lend support. The new website has been launched just in time for the July edition of the Stone Farmers’ market, which will take place in the town’s Georgian High Street on 4th August (followed by Sat 1st September). Head to www.stonefarmersmarket.co.uk to see the new site for yourself.